Six MPs have left the faction of the Communist Party in Ukraine's parliament. Verkhovna Rada Chairman Oleksandr Turchynov announced this at parliament's meeting on Tuesday, an Interfax-Ukraine correspondent reported. 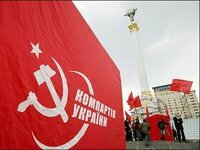 Serhiy Honcharov, Oleksandr Holub, Oleksandr Zubchevsky, Volodymyr Kudria, Vasyl Samoilenko and Oleksandr Prysiazhniuk announced that they were leaving the Communist Party faction.